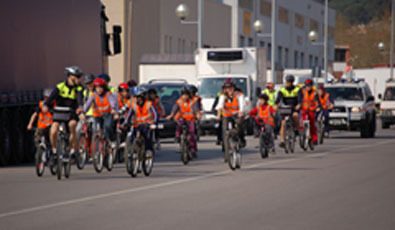 The program of road safety education is a direct bet on the training school to school. Potentially cores are points of congestion and time of chaotic traffic situations, often resulting in areas of risk to drivers, pedestrians and mobility difficult for transport and other road users. The draft road safety education as its main objective to develop habits of conduct safe mobility in school zones. School zones by nature are points of conflict at the level of movement. The agglomeration of people, vehicles, school transport, concentrated in a very specific space and time, make these places, generating zones of danger and stress. Particularly serious is the accident rate associated with children because they are a population group particularly vulnerable to traffic accidents and significant impact on families. Adolescents are also a risk group both because of their inexperience in driving and by the willingness to assume risk behaviours. Early education and training is the solution for processing more efficient in the medium and long term, to change attitudes and habits, and convey positive values / insurance when moving by road. With these parameters is a plan of education for schoolchildren, ages ranging between 6 and 16 years. This program aims at developing habits and safe behaviours among students mobility. We have developed a teaching and learning materials concrete and specific to the school population. In this material are reflected all the issues of urban mobility and affecting the municipality. The first issue is to agree with schools, to include these sessions in their activities, including sessions on subjects, where the recognition by the institution, parents and students of the sessions that were to be taught. The training activities were carried out in schools and school hours, The training activities in schools have been conducted by two police officers who are destined to the area of education and safe mobility. The results can be regarded as very optimistic, as valuations made by different departments and schools. The results of student attendance has been very satisfactory, with a total of 2282 students, following the events, covering the training compulsory for all primary and secondary education. With the success of this program of education and training in schools has been established to implement online skills in road safety management programs safe mobility of the local police for the whole municipality and the specific problems that occur. Following this line and looking into the future, agents and safe mobility of Education shall develop a management program to protect schoolchildren. No new updates in 2011.